JSG Industrial Systems is a leading supplier of products and engineered system solutions for centralised lubrication, materials dispensing, fuel and flow management, and fire suppression. The company’s services include the provision of market-leading products and assistance in engineering design using the latest 3D design software, installation, maintenance and technical after-sales support to suit specific needs. Our engineered systems are designed to maximise productivity, reduce downtime, decrease operating costs and protect your investment in equipment, people and the environment. JSG Industrial Systems offers a complete range of lubrication management products and solutions to suit almost any application. The portfolio includes solutions single-line parallel and progressive systems for oil and grease, chain and gear lubrication, as well as dual-line, oil circulation, wayside lubrication, and material dispensing systems. A wide range of specialised products and systems is available for all types of lubrication application. JSG understands fuel and flow measurement and how critical it is to transfer and measure important and expensive fluids. Fuels, oils, chemicals, water and other liquids need to be managed accurately and with efficiency to minimise machine downtime. The company offers an extensive range of products and solutions, including flow meters, diaphragm pumps and hose reels from world-class manufacturers such as FlowMax, GPI, Flomec, Trico, Lincoln and SKF. Combining experience and expertise with that of JSG’s suppliers ensures clients invest in the right product for applications in the mining, construction, heavy earth moving, transport, chemical, agriculture and marine vehicles. JSG and MusterII advanced fire suppression technology provides clients with protection against fires, ranging from a single handheld extinguisher to a transportable manual system or a complete, engineered automatic actuating solution. 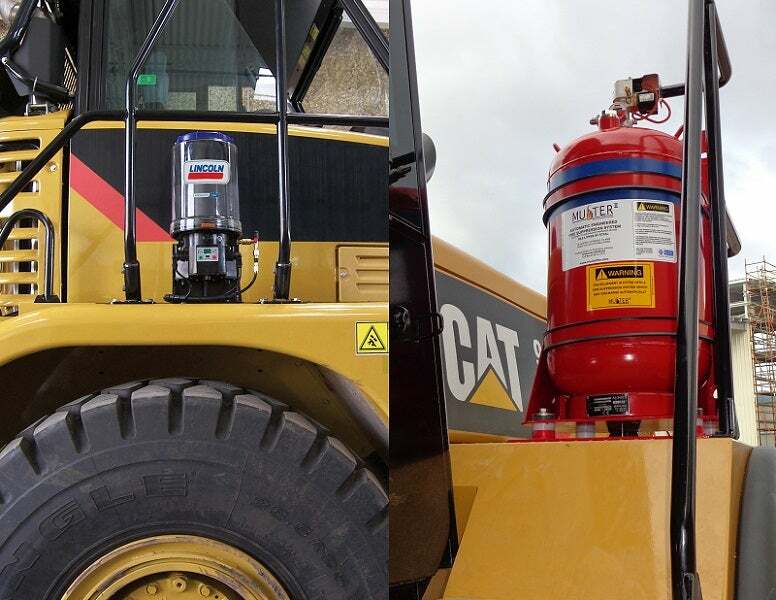 MusterII fire suppression systems are designed to protect personnel and assets from the inherent risk of fire, by combining cutting-edge technology with innovation in product design to produce a state-of-the-art fire suppression system. The system’s high-accuracy is controlled using intelligent pressure sensors, enabling discharge times to meets the initial design criteria, effectively suppressing fires in the adverse conditions where many machines operate. The fully monitored MusterII is available with multiple extinguishing agents, and fire sensing modes to suit any application. The 24/7 monitoring capabilities are available for all system types, allowing the operator to view the overall system integrity to ensure that the correct pressure is at each sensor. MusterII comes with stainless-steel components, which ensure performance in challenging environments and that it is activated when a fire is detected, protecting assets and personnel. JSG Industrial Systems, part of the John Sample Group, was formed back in 1968 and began servicing the mining, industrial and original equipment manufacturer (OEM) markets. Since its inception, the company has been a partner of Lincoln Industrial & SKF lubrication products, systems and asset management solutions. Over time, it has been recognised as experts in this field, and partners with suppliers and clients in the ongoing product development for challenging applications. JSG has built a strong network of subsidiaries, branch offices and partnerships to reach customers across Australia, New Zealand, Indonesia, South East Asia and southern Africa. Infrastructure developed to support the lubrication business through the 1970s and 1980s allowed the company to expand its range of products and engineered solutions to include systems for fuel, fluid and flow management, and fire suppression to protect equipment, people and the environment. JSG is also associated with GPI (Great Plain Industries), Flomax and All-Flo. JSG Industrial's relationship with Lincoln lubrication began back in 1968. Within this time both companies have worked very closely together to support and distribute class leading lubrication products and systems to the Australasian marketplace. Starting in November 2012, SKF will be joining this union.